Color-Coded Chopping Board Just $29.79! Down From $60! PLUS FREE Shipping! 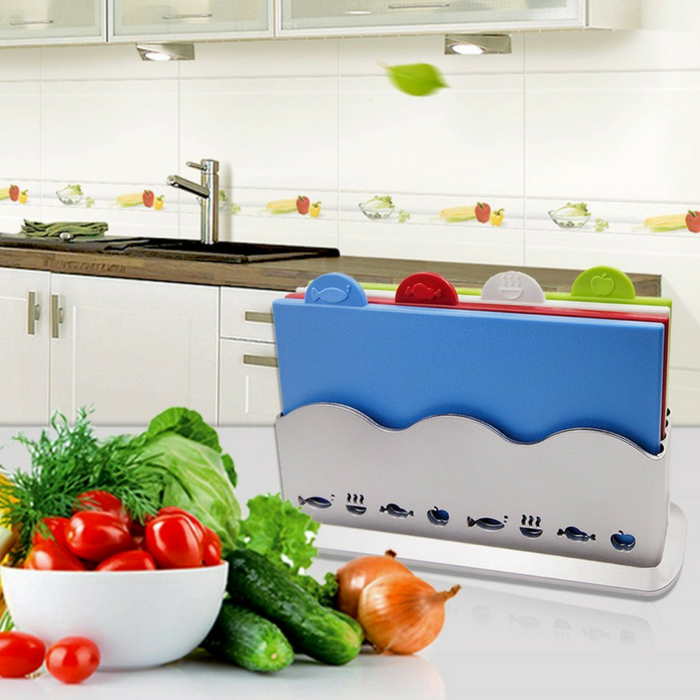 You are here: Home / Great Deals / Amazon Deals / Color-Coded Chopping Board Just $29.79! Down From $60! PLUS FREE Shipping! Don’t miss this deal from Amazon! Get this Index Cutting Color Coded Chopping Board for only $29.79, down from $59.99 PLUS FREE shipping! This Index Cutting Color Coded Chopping Board is a new and multifunctional cutting board set. It prevents cross-contamination of food with a simple yet effective. It saves storage space and has a draining tank. The storage case has the function of the drainer, water flows from the bottom and inhibits the growth of stain and mildew and easy to clean. Since there’s a separate board for each food, you and your family’s lives will be healthier, safer, and better. Food Grade Safety Material: The cutting board set is made of food grade PP plastic, non-toxic, high hardness, double-sided available, the surface is frosted and won’t slide. 4 Color-Coded Cutting Board: Plastic cutting board features color code, designed to prevent cross-contamination of different food types like fish, vegetable, meat, and cooked food so it is cleaner and healthier. Unique Drain Storage Case: The storage case is designed as a drain tank with double function of storing and draining, water flows from the bottom to prevent the cutting board from mildew and easy to clean. Space Saving Storage Container: Each cutting board measures 11.8 x 7.9 x0.25 inches and the storage case measures 12 x 5 inch. The combination design makes the volume smaller and occupies less space, more convenient to store. 100% satisfactory service and a 100% no risk money-back guarantee.